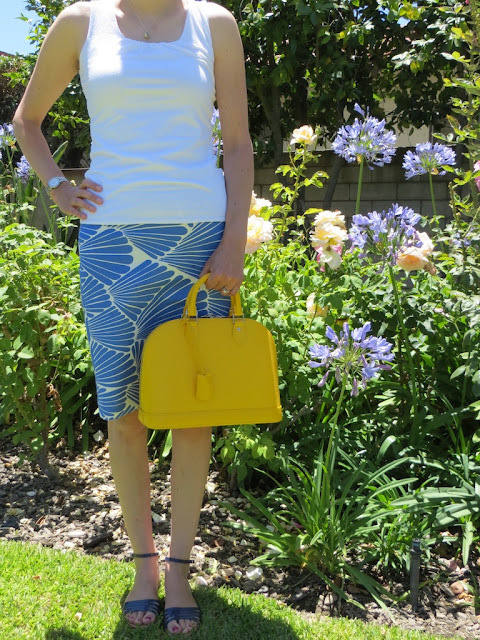 I didn't do much to style this particular outfit, but sometimes that is a good thing for a hot summer day like today! My husband and I went out to lunch with his grandma. Her two favorite colors are blue and yellow, so I thought she would appreciate this particular color combination! I am wearing the J. Crew No. 2 pencil skirt in Fanfare which is another one of my favorite prints offered for their spring/summer collection this year. I am also a "fan" of the No. 2 pencil skirt and my closet is full of this style skirt in various patterns and colors! This is another item that can be picked up for a steal during J. Crew's extra 30% off summer sale. My bag is the LV Epi Alma in Citron. 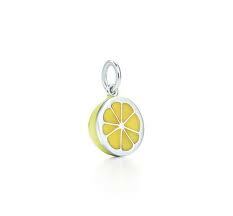 To go along with my "citrus theme" I am also wearing a lemon charm designed by Paloma Picasso for Tiffany and Co. Speaking of lemons, we are growing some lemons right now in the backyard, but the trees are young and not producing fruit yet. That's probably a good thing because William would pick the lemons off and eat them! I would love to see him make a sour face while doing that! Omg Katie.... Your store has the fanfare skirt? !